I get it. This totally looks strange. What is the point of having a stranger put suction cups all over my body? What can be achieved by getting this type of bodywork done? Well let me tell you, cupping therapy can feel just as amazing as a full body massage. In fact, cupping can be more beneficial than regular massage for some conditions. How so? Read on to find out! So what is cupping therapy? It's bodywork that uses suction to lift tissues as the cup moves. This suction can help with problems in the lymphatic system, scar tissue restrictions, general inflammation, and relieving chronic pain conditions. The therapist will use cups made out of glass, earthenware, silicone or plastic to create the suction needed for the therapy. In my practice, I use a combination of silicone cups and glass/bio-carbonate plastic cups with a MediCupping machine. 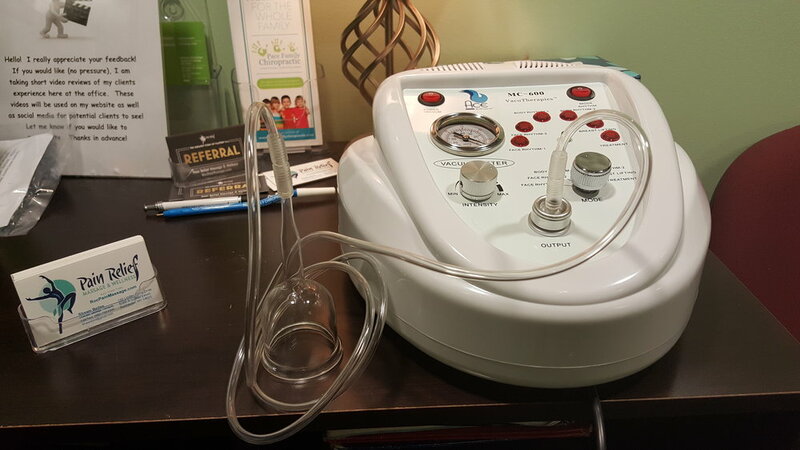 The MediCupping machine allows me to control the intensity of the suction from the cups and can provide a deep sense of relaxation. I'll talk more about this in a bit. Think of cupping as the opposite of massage. With massage, the practitioner is compressing & stretching the tissues of your body with a positive force. With cupping, the tissues are lifted & stretched with a negative force. Both are equally beneficial to the body. But what makes cupping special? It can be more effective in restoring restricted tissues of the body by lifting & separating fused tissue layers (ie. IT Band Syndrome). If your back feels like a coffee table, cupping therapies will help improve circulation and promote relaxation of those tight areas. I tell my clients that the cups are like a meat tenderizer. They soften up the tight tissue so that I can go deeper with my massage techniques. In traditional Chinese medicine, the practitioner places the cups on areas of blocked Qi (areas that are in dysfunction) and can leave the cups placed in the same spot for 10-20 minutes. This helps pull stored toxins from the body that the liver & kidneys couldn't adequately clean out. Many acupuncturists use cupping in this manner as their work is based on the traditional Chinese medicine model. As a massage therapist, I use cupping in a different way. If the cups are parked for more than 3 minutes, it crosses over into traditional Chinese medicine; which is outside my scope of practice. So we move the cups & keep them active for most of the massage session. Sometimes I keep the cups parked for 2-3 minutes on really tight areas to improve areas affected by limited range of movement and trigger points. This can feel better than traditional deep tissue massage with an elbow in the back (and feels better). In my regular massage sessions, I like to use plastic & silicone cups for static placement which helps relieve pain in tight areas. For a deeper cupping session, I use my MediCupping machine which can help sedate the nervous system with many pain conditions. Using the MediCupping machine, I can control the intensity of the suction as well as track progress by using the gages on the machine to replicate results for future sessions. You can check out what MediCupping looks like on the video below. So now that you know the general application of cupping, how does it help? Many of my clients have seen improvement of these conditions just after a session or two of MediCupping. What surprised me is how well scar tissue responds with multiple MediCupping sessions. A therapist friend of mine had restricted movement in her arm & shoulder because of her scar tissue. Not only did the MediCupping treatments help smooth out some of her scar tissue, her range of movement improved. Now she can move the arm & shoulder unrestricted. Below is a before & after picture of her arm. What the after picture doesn't tell is that her scar tissue feels more smooth instead of leathery. Unfortunately cupping isn't for everyone. Cupping may not be the best idea for those who are taking blood thinners. People that have skin conditions or very thin skin should not receive this treatment; as there can be potential harm from the suction. Likewise, if you bruise easily you may want to be careful of cupping therapy. If you're an energetically depleted person, MediCupping is probably not a good idea as it has a sedating effect on the body. It's always best to err on the side of caution by getting cleared from your primary care physician if there is any health concerns receiving cupping therapy. You may have seen these cupping marks on athletes or celebrities before. It's not a bruise! We call it a cup kiss. The cup kiss is a discoloration of the tissues due to stagnation of blood under the skin's surface. These happen more often in areas of dysfunction such as really tight muscles. The mark may look like a circular bruise, but there shouldn't be any pain associated with it. Typically those receiving cupping for the first time will likely get these marks. Once the body has received the treatment a number of times, the occurrence of these marks happens less. The marks can stick around from 1 to 10 days. Redness & itching can occur as cupping therapies increase vasodilation (which decreases blood pressure). When you have a lot of inflammation in the body, it can be brought up to the surface of the skin which can cause the redness. This may also make you feel really warm after a cupping session. Since MediCupping can sedate the nervous system, you may feel very tired or worn out after a full session. It would be best to plan a MediCupping session for when you can relax afterwards. I can attest that after receiving a MediCupping session, I just want to go home and take a nap. However, I've had clients that felt more energized after the session (after receiving several treatments). It's always a good idea to drink plenty of water after a MediCupping session. You may leave slightly dehydrated from the cups moving the tissues and blood around. The hydration will help. No hot bath's, shower's, sauna's until the next day. Do not exercise until the next day, as your body needs to recover from the cupping session. I also wouldn't advise clients to get any other bodywork for up to 48 hours after treatment. This could overload your system or possibly negate the work that was done during the cupping session. I've performed MediCupping sessions on several massage therapists when I initially received my MediCupping machine. You can play the video below to hear their reactions. Overall, from both clients and therapists alike, MediCupping is an enjoyable, relieving, and relaxing experience. If you've read this far, then you might be interested in trying a MediCupping session in the near future. My office is located in Rochester, NY. Anyone in the Rochester area looking to book a MediCupping appointment can do so online HERE. If you're not in the Rochester area, just google cupping massage & see who may practice in your area. I hope you found this informative, and if you have any questions, just leave them in the comments below. Thanks! Shawn Belles is a Licensed Massage Therapist who is certified in Ace Level 1 Massage Cupping & Ace Level 1 MediCupping. His practice (Pain Relief Massage & Wellness) is located at 150 Linden Oaks Drive, Suite A (Lower Level), Rochester, NY 14625.